Click the Add button on the top left. Select List/Task to add lists and tasks respectively. 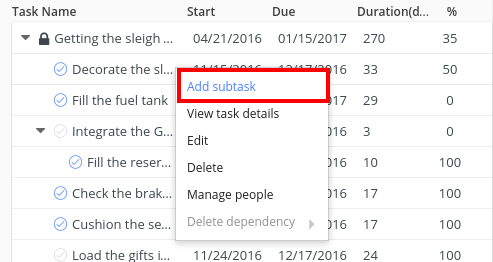 Alternatively, when you right click on a task list or task in the left panel you’ll get the options to add task and subtask respectively. Lists and tasks added from here will be synced in other sections as well. While adding a task you need to select the task list in which you want to add it. To edit/delete task lists or tasks right click on them in the right panel and you’ll see the options. Milestones that are created in calendar will automatically show up in gantt chart. Here’s how you can create milestones in calendar. 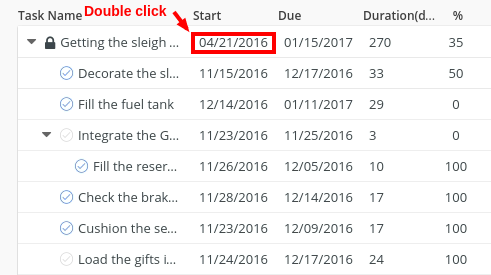 To set/change start and due dates of a task, double click on the date panel. Alternatively, you can drag the task container on the gantt chart to change the dates. You can drag the task container from the start or end to change the start and due date respectively. Once the dates are set you’ll be able to see the duration of the task in the next panel. You can also set the duration of a task and due date will be set accordingly. To set the duration of a task double click on duration panel. 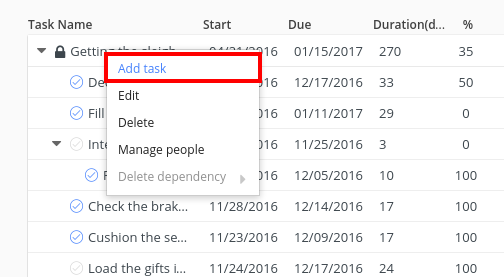 Double click on a task to edit the name of task directly from here.